The classes that make up the JCR Compact Node Definition (CND) file sequencer. CndFromEcore Utility class to generate a CND file from an ECore model. ModelSequencer A sequencer of Teiid XMI model files. TeiidI18n The internationalized string constants for the org.modeshape.sequencer.teiid* packages. VdbModel A simple POJO that is used to represent the information for a model read in from a VDB manifest ("vdb.xml"). VdbSequencer A sequencer of Teiid Virtual Database (VDB) files. 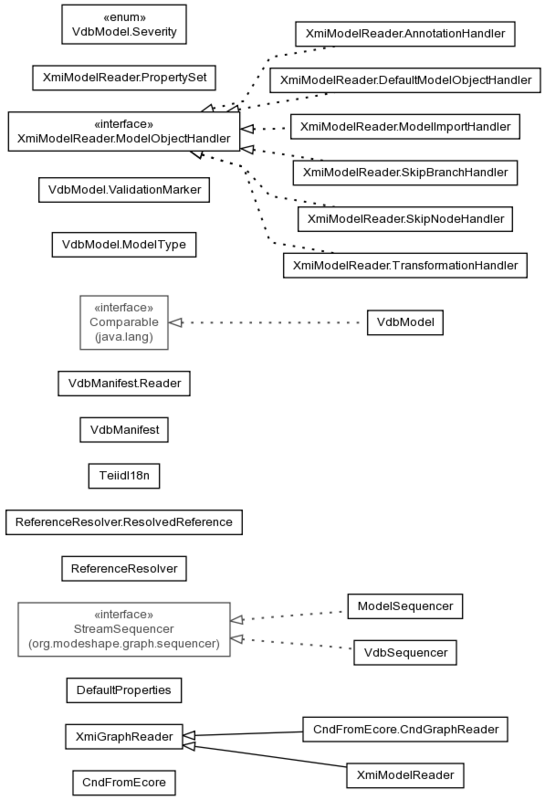 XmiGraphReader A class that can be used to read an XMI file that has been imported into a graph. VdbModel.Severity The 'vdb.cnd' and 'teiid.cnd' files contain a property definition for 'vdb:severity' with these literal values.